Lake Buckhorn is a 220 acre man-made lake located in Holmes County, Ohio. It features a private, gated members only community. The smooth waters are perfect for watersking, tubing, enjoying personal water craft or going for a relaxing ride on your pontoon boat. 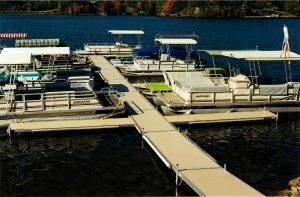 Lake Buckhorn docks and lifts by Metal Craft Docks have been installed and admired for more nearly 20 years. With low dock maintenance, homeowners are able to enjoy all that Lake Buckhorn has to offer from their lake front view. Since 1998, Metal Craft Docks have been installed and enjoyed on Lake Buckhorn. Our docks feature all aluminum construction with a superior non-skid, baked poly-acrylic aluminum decking perfect for ensuring boaters safety as they enter and exit watercraft. Our stationary docks are a perfect solution for water depths ranging from a few feet up to 9′ depth. Dock pier sections are available in four widths and three lengths. Additional accessories such as a color matching bench, dock cleats and dock ladders offer more enjoyment for your summer activities. Launch docks and rental docks purchased by Lake Buckhorn POA are still in use today almost 20 years after their original purchase. Aluminum docks are a great alternative to wood which rot, decay and splinter over the years. Contact the Lake Buckhorn POA for guidelines and restrictions when you are planning your new dock. Pontoon boats and personal watercraft are in great abundance at Lake Buckhorn. Protecting your watercraft from damaging debris and aquatic life is a necessity. Metal Craft Docks manufactures all-aluminum vertical boat lifts in 4000 and 5000 lb models. The deep “V” design allows for entering the lift in shallower water while extended legs are also available for deeper water. The lift sides are trussed for extra strength and are open for easier boarding. Nylatron pulleys, stainless steel cables, and stainless steel fasteners are standard features on all Metal Craft Lifts. Upgrade from standard bunks to a pontoon lift kit, add an electric motor and a lift canopy and you’ve just bought yourself more time on the water! Cantilever jet ski lifts are also available in an all-aluminum design and accommodate watercraft weighing from 850 lbs to 1200 lbs. Contact us to help you determine which lift is best for you! Metal Craft Docks is a family owned and operated business priding ourselves on exceptional quality, design and outstanding customer service. We have been manufacturing docks for over 80 years! Metal Craft Docks and Lifts are naturally light-weight making installation and seasonal removal for storage easier. We are proud of the craftsmanship that goes into every one of our products manufactured locally in our Painesville, Ohio facility. When you purchase a Metal Craft Dock and Lift you are making an investment. We know you will be happy with your Metal Craft purchase for decades to come!